In a match that was important for both sides to win, a draw should be satisfying. Both sides get a point, no one loses. But I think both sides felt a little like they got the short end of this stick, and to listen to the post match comments from Allegri and Galliani, one must assume that they got a little bit of Island Fever. The match itself had everything you could want – great pace, possession switching back and forth, goals, non-goals, good calls, questionable calls, great saves, great shots… really a great game. That the result should be marred by comments made off the pitch sells the football short. 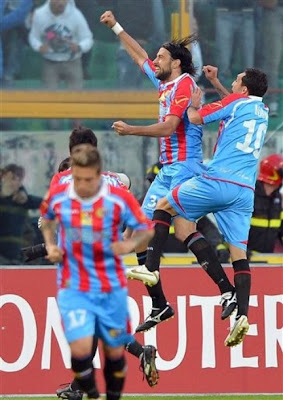 Catania came out fast, demanding that Milan keep up with their pace, which they did. Their attack threatened early, but our defense, specifically Bonera, answered equally well. In the 4th minute, for instance, Bergessio made a run in toward goal, 1 v 1, but Bonera caught him and force him to shoot wide. Answering back just 2 minutes later, Urby missed a great shot on the other end. Ibra had a great shot saved in the 17th, Carrizo was on top form on the day. In the 20th, Bergessio headed a shot over the crossbar, and the next minute later, Nocerino did the same at the other end. And just to prove he was not a one save wonder, Bonera had a great clearance on Bergessio in the 32nd. 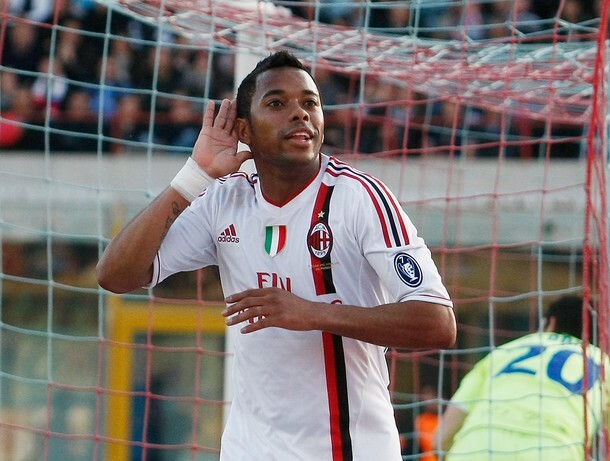 But it was in the 34th that the first goal came, from a slightly unsuspecting source: Robinho. He did a fantastic 1-2 with Ibra, who was also being assaulted at the time, but managed a brilliant left-footed flick. 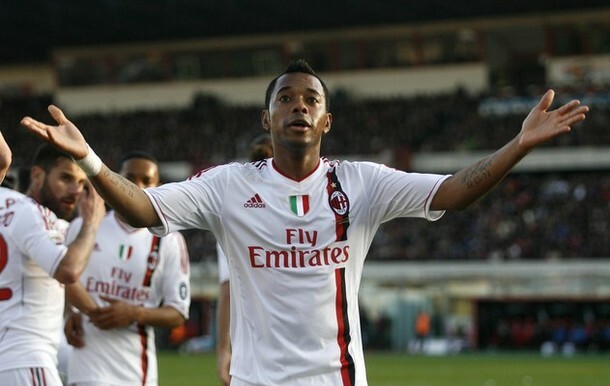 And as Robinho got closer to goal, you had to ask yourself: which Robinho is this? But he slotted it home in style to answer that question. This was our double-0-7-0 that we know and love. Goal. 0-1 Milan. In the 38th, Gomez, who was brilliant in this game, rattled one off the crossbar to give Milan fans a heart attack. As the first half wound down, the pace slowed a bit, but the drive did not. Play started to get more physical, but to the ref’s credit, he gave only warnings throughout this half. I had to laugh, though, in the 42nd minute, he was checking to see if Aquilani was okay, and put both hands on Aquilani’s shoulders, like a concerned dad or something. Awww. The second half started off with controversy, as Gomez had a goal called back for offside. Upon initial viewing, this seemed wrong, as he himself was not offside. But going back on the replay, it was obvious that Bergessio was just offside when the ball was initially passed to him, and since he was the one who assisted on the goal, he was involved in the play, and thus, offside. Excellent and tricky call from the assistant ref. Tired old captain? Or experienced and driven workhorse? The first card of the match was awarded to Mexes in the 51st, with Ambrosini earning his just 8 minutes later. Allegri amazingly subbed Boateng on for Urby in the 52nd (yes, the fifty-second minute!) It was probably to give Boateng more time in preparation for Tuesday, but I like to believe it was tactical, as Urby wasn’t at his usual awesome Urby best. 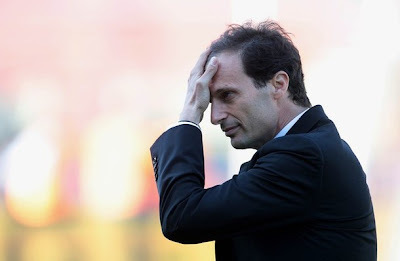 It has long been a fantasy of mine that Allegri would make a tactical sub before the 65th minute. In the 55th, Lodi, Catania’s top in scoring and assists, made a very dangerous shot, but luckily, it was wide. And then the heartbreak came in the 57th, when Spolli scored the equalizer. 1-1 all. Controversy then reared its ugly head in the 61st, when Ibra was whistled for offside. Replays show that Gomez was actually keeping him onside when the ball came forward, but this is an easy mistake to be made, and not necessarily a gamechanger, since no goal was actually attempted. However, the ‘fool me once, shame on you, fool me twice, shame on me’ principle came into effect not two minutes later when Boateng was also whistled offside. Replay shows that Ibra was standing in an offside position, but not being involved in play, should not have influenced the whistle. Maybe his large, hulking figure blocked the view of the ref? I don’t know. Too bad, though. Not an egregious error, very human, even twice in 2 minutes, but disappointing. However, despite discussion by fans worldwide about these calls, the match proper was still going on. In th 64th, Almiron had a shot that went over the crossbar. And then in the 65th, more controversy. Robinho had a shot that was cleared by Marchese. Or was it? Many think it crossed the line. Which is definitely true. Part of the ball crossed part of the line – I think everyone agrees on that. Whether or not the entire ball crossed the entire plane of the line has been the subject of much heated debate, and even Allegri losing his cool in post match comments. I have yet to see a picture or a video or a slow motion replay that convinces me that it was completely across, what an amazing clearance by Marchese. However I will say, going though so many images and replays, the assistant ref is the controversy here – he was not in line with the second to last defender, as he should have been, and thus, not able to make a definitive call, even if the human eye could make one. A shame, as this would have likely sealed the match for us and meant two more points. But I firmly believe it is up to a team to win the game in spite of the ref, and Milan did not do that today. Regardless of controversy, we only have ourselves to blame. In the 73rd, Bonera had another great save, and then Allegri brought in El Shaarawy for the clearly tired goalscorer, Robinho. Allegri was going all out, he wanted the win. And the team answered him in effort. In the 76th, Mexes had a great header that forced Carrizo into a great save, and 2 minutes later tried another header, with the same results. Ibra had a great cross straight across the face of goal in the 79th, then a great shot by El Shaarawy in the 84th. As if it wasn’t clear enough Allegri was going all out, he brought on yet another striker, ex-Catania’s Maxi Lopez, for Aquilani in the 85th. Go Allegri! In the 89th, Ibra tried to chip it in, but Carrizo once again saved Catania by tipping it over. Then right after, Mexes attempted another header, but just couldn’t quite make contact. In the dying seconds of the game, Antonini made another spectacular save against Seymour. He and Bonera both had amazing games again tonight, and I find myself thinking of jokes about them as a distant and hazy memory. Nice to have them both step up when we needed them most. Abate! A sight for sore eyes. 90 minutes strong. That was it, an unremarkable 1-1 finish to a brilliant game where both teams played well. It is sad to see the controversy eclipse what was such an exciting match, a game played at a pace that excites me for Barcelona on Tuesday. So many players stepping it up, players coming back. I will tell you what was weighing heavily on me for most of the match – when Amelia was warming up, and it looked like Abbiati was definitely playing in pain. That worries me so much, even if Amelia is a great keeper, there is a reason that Abbiati is number one. Reports say Abbiati will be evaluated tomorrow, let’s all cross our fingers it’s nothing serious. We went to the island, we played well, and we still dropped two points. Disappointing? Sure. Does it mean we are doomed? No. Juve have to hold off a great Napoli team tomorrow, and if they pull off their preferred draw, we are still in the same position on the table. Even with a win, we will still be 2 points up on them, with a much easier schedule. Allegri said going in that this was an important match, and I don’t think it was about the numbers. It was about how well the boys played, and I think they did very well against a very motivated Catania side at home. Now we just have to overcome this Island Fever and be ready for Tuesday. Well done. Catania vs. Milan: Game On!